Retail expert and television personality known as the host of Mary, Queen of Shops and its subsequent spinoff shows. She also served as a co-manager on the show Hotel GB. Due to her parents' deaths early in her teens, she turned down a spot at the Royal Academy of Dramatic Art to support her younger brother. It was then that her career in retail began with jobs at John Lewis and Harrods. 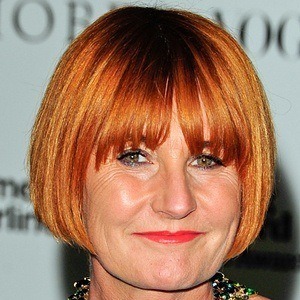 She has published several books, including the informational books Windows – the Art of Retail Display and How to Shop with Mary, Queen of Shops and the memoir Mary Portas, Shop Girl, a memoir. She was married to chemical engineer and Unilever executive Graham Portas from 1989 to 2003. They had two children, Mylo and Verity. She then married partner Melanie Rickey in 2010. She and Rickey have a son, Horatio, born of sperm donation from her brother Lawrence Newton. On Hotel GB, she served as co-manager alongside notorious restauranteur Gordon Ramsay.